Join the Hohlax Trio on a musical journey to Greece, from the backstreets of Pireus to the magical islands of the Aegean. 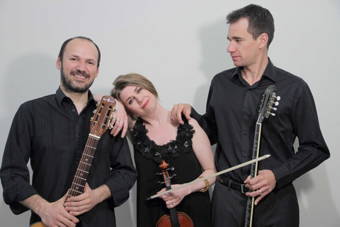 With Jaime Smith on violin, Orestis Koletsos on bouzouki, and Apostolis Kounis on vocals, guitar, and oud, the trio plays a unique blend of traditional Greek music and contemporary urban riffs. The name Hohlax derives from Hohlakas, a beach on the island of Amorgos, where the band came together in 2007. Since then, they’ve played in Athens, Cyprus, and California, and are now returning for a second West Coast tour. Jaime Smith grew up in Sacramento, studied violin at the New England Conservatory of Music, and won a Fulbright Scholarship to Greece, where she attended the National Conservatory and studied makam, a system of Greek and Turkish melody types that provides a complex structure for composing and performing. Jamie has spent the past 12 years living in Greece, performing internationally and studying with Christos Tsiamoulis, the country’s leading expert on makam theory. Orestis Koletsos, born in Paris and raised in Athens, began playing bouzouki at the age of 15 and has been performing, recording, and writing songs for more than a decade. Apostolis Kounis, from Larissa in central Greece, began singing and playing guitar at the age of 12, studied at the Modern School of Music in Thessaloniki, and went on to Athens to explore Byzantine music and harmony as well as the intricacies of the oud. For an evening of entrancing Greek melodies, catch the Hohlax Trio at the Freight.